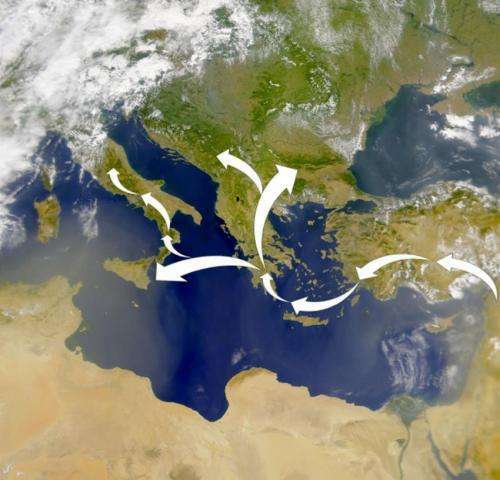 (Phys.org) —A multinational team of researchers has concluded that Neolithic farmers migrated to Europe from the Near East via the islands that dot the Mediterranean Sea between Turkey and Greece. 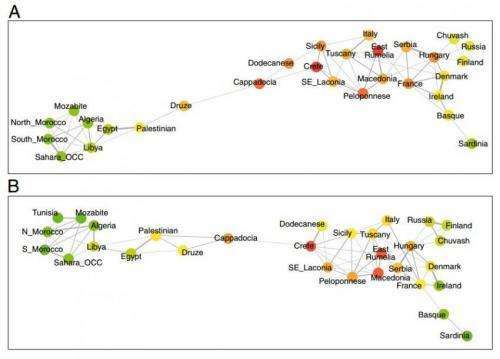 In their paper published in Proceedings of the National Academy of Sciences, the team describes how they used genetic analysis on a large number of volunteers in the Middle and Near East and Europe to trace the path of early migration into Europe. The team collected DNA samples from 964 people living in 32 different places in the region—from northern Africa, to the Middle and Near East to islands in the Mediterranean Sea, to the European continent. Each of the DNA samples was scrutinized for markers known as single-nucleotide polymorphisms (SNPs). People from the same place tend to have SNPs in common, which makes tracking their migration possible by looking for such markers in different populations. Analysis of the samples allowed the researchers to trace the movement of early people from the fertile crescent in the Middle East, to the Near East and into Turkey, and then as they sailed to nearby islands off the southern coast and finally, as they arrived on the southern shores of mainland Europe. Something overlooked here is during those time periods much of the Mediterranean Sea had a much lower water level than now, so that it is clearly possible that they Walked instead of island hopping. The populations on those island would have come, originally, from the people living in the lowlands around what were once mountains, and they now inhabit the tops of said mountains. Travels between them would have helped to spread bloodlines some, but the basis would be the original peoples forced to live on what had just become an island.